Siberian larch cladding supplied by Vastern Timber is sourced from reputable sawmills processing larch logs from well managed forests in northern Europe. Where possible our larch is sourced with independent certification. Siberian larch trees grow very slowly and consequently the larch wood is extremely dense and strong when compared to other softwoods such as spruce and cedar. The high resin content found in Siberian larch makes it one of the most durable softwoods in the world. Siberian larch, which is a straw colour, similar to pine, should not be confused with the European larch growing in Britain, which is a dark pink colour. 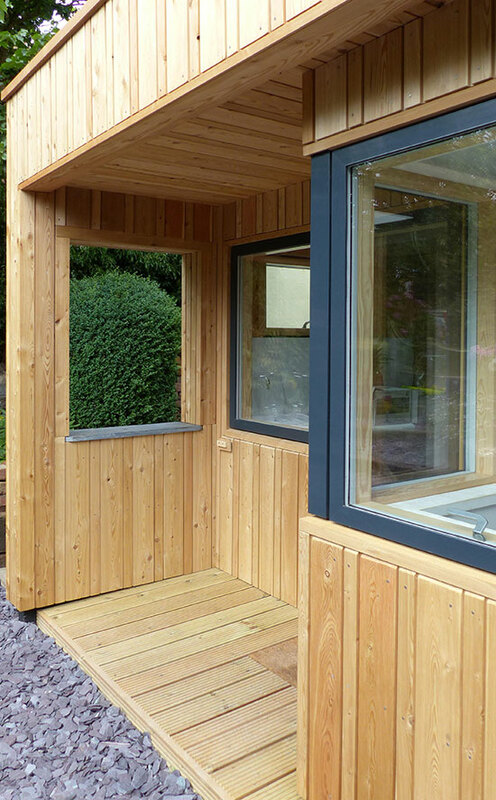 Unlike European larch, the knots in Siberian larch cladding are a lighter grey colour and tend to stay solid even after drying and machining. For this reason we tend to favour Siberian larch over British larch for machined cladding profiles. Siberian larch cladding is generally available in two grades, which in the trade, are confusingly named ‘Unsorted’ and ‘Fourths’ (or sometimes ‘Sawfalling’). For ease, we describe our stocks as either Grade A or Grade B. Grade A allows for occasional small knots, although many boards will be clear of defects. Grade B allows for frequent and larger knots. We most commonly offer Grade B because it offers a very cost effective cladding option. Care should be taken when relying on the trade names as the relative quality between Russian sawmills is highly variable. As with all larch species, the Siberian version is a relatively ‘lively’ timber and as such, it is prone to distortion and dimensional variation. 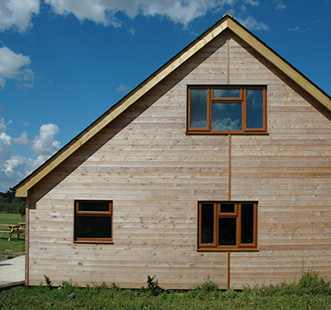 Throughout the year a 145mm Siberian larch cladding board can vary by up to +/- 5mm. We therefore recommend simple cladding profiles such as halflap (VHL) and splayed (VSP) that can accommodate this movement rather than more delicate TG&V profiles. 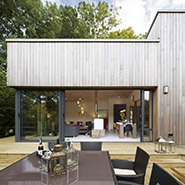 Siberian larch cladding is a good choice for exposed elevations where knocks and scrapes are likely. Grade B is appropriate for projects where a natural or rustic appearance is desired, whereas the relatively knot free Grade A will create a more contemporary looking facade. Appearance The wood is a golden yellow colour with a strong grain pattern, similar to pine. Depending on the grade, the boards may include some, or many, dark black knots. Profiles Shiplap, halflap and splayed profiles. Not recommended with tongue and groove profiles (VTG) due to movement. When to fix Ideally Autumn / winter months. Grading Grade B (Known in the trade as 4ths or Sawfalling). To knotty to conform to any standard. Grade A (Confusingly known in the trade as Unsorted) BS1186-3 1990 Class 2. EN942:2007. J30. CE grade A. Clean with a few sound knots up to 30mm. Extractives Siberian larch contains resin rather than oil or tannin. The resin is fixed by kilning and does not tend to bleed. The resin is not reactive.